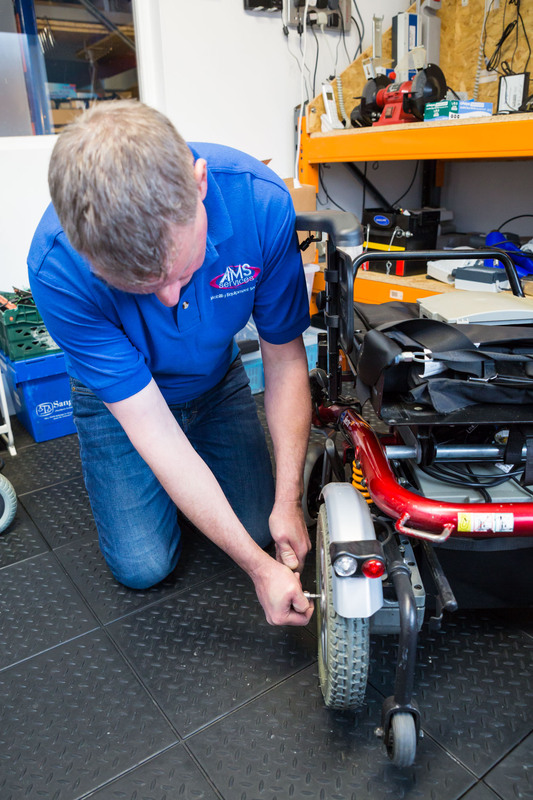 How to I care for my electric wheelchair batteries? Electrically powered wheelchairs are an excellent means to freedom and independence for you. Confidence in the performance of a powered mobility product is essential, so below are some useful tips for how you can maximise the reliability of your batteries! It cannot be stressed enough how important it is for the batteries to receive at least an 18‐hour uninterrupted charge as soon as possible. This process is known as “priming” and is vital because batteries only have a holding charge when supplied. Charge by hours, not by the lights! The lights on the controller or the charger units are guides. It is always better to leave the batteries charging for as long as possible, rather than finishing a charge early because the controller or the charger lights suggest the charge is complete. You cannot over charge your batteries – so follow the rule that the longer the better. There is no need to let the batteries run down between charging. Even if the power chair has been used very little it is recommended to charge the batteries overnight for a minimum of 12 hours. Regular short charging (less than 2 hours) is inadvisable. This damages the battery cells and creates a shorter life span. Power wheelchair batteries are one of the few products where the performance improves with use. After being used and charged around 10‐20 times the capacity of the batteries actually increases until they reach the maximum. The ideal operating temperature for batteries is between 18˚C and 25˚C. However unlikely, do not charge batteries in temperatures under 10˚C or over 30˚C as this will lower the battery’s capacity and therefore shorten its life span. Stay in the green and out of red! While driving try and maintain a consistent speed, as constant direction or speed deviations can have a negative effect on battery life. If possible, try and avoid allowing the batteries to run into the red lights on the controller. This causes what is referred to as a “deep discharge” and the battery may become flat. Obviously on occasion this will be unavoidable, but letting this happen too often can lead to the batteries becoming damaged. Follow the above steps and you should be free to enjoy your powered mobility product performing to the best of it’s potential, while benefitting from the freedom it was designed to provide. My Mountway Neptune battery does appear to be holding a charge, what now? This is a question we are met with almost every day, quite often it is not the battery that is at fault initially but the charger not putting the correct voltage out. To save on the expense of replacing the battery or charger unnecessarily we offer a free testing service. Just pop your battery & charger in the post to us and we will be able to determine where the fault lies. How can I get the best lifespan from my mobility scooter batteries? A guide to getting the most performance and lifespan from your scooter batteries. No vehicle performs well without an efficient fuel system. Mobility scooters are no exception. The batteries fitted to scooters act as their fuel tanks and should be well maintained accordingly. Q. What is the best way to commission / prepare mobility batteries in order to get the most out of them? A. Even though your dealer should have fully charged the batteries on your scooter prior to delivery, it is recommended that you charge the batteries before first use. When you have finished for the day put the batteries on charge and LEAVE them on charge until the charger has finished charging. The cost of over night charging is minimal and as long as a suitable automatic charger is being used there is no reason to disconnect the charger until the equipment is next needed for use. Most mobility scooter batteries are defined as “traction” or “deep cycle”. These batteries start with a very low capacity, and as they are charged and discharged through normal use over a period of time their capacity (available power) increases and eventually peaks at its maximum level. This will affect the range of scooter, from 60% to 100% of the stated range, depending on the number of charging cycles. Therefore in its early life it will appear to have low power (approximately 50% capacity available), and after using the batteries between 10 to 15 times (charging / discharging) the battery should achieve approximately 100% of its capacity. Q. What lifespan can I expect from my batteries? A. Although most manufacturers normally offer a 12 month warranty against manufacturing defects on batteries, mobility batteries should deliver an average lifespan of up to 18 months depending on usage. In a ‘light’ mobility application such as using your scooter once or twice a week the battery can deliver up to three years lifespan, in a ‘heavier’ application such as using your scooter daily on long journeys, the lifespan could be between 12 – 18 months. Q. What things can affect the range of electric scooters? A. The weight of the vehicle and user, ambient temperature, state of battery charge, tyre pressures and terrain can all affect the range of batteries. If the temperature range is outside of our yearly averages i.e. above 35 degrees celcius and below freezing this will affect the range of the battery. If the battery’s “state of charge” is low, then consequently the battery capacity will be low. Q. Can my batteries be transported by air? A. Most sealed mobility batteries can be transported by aero plane, your battery supplier or dealer can provide an IATA certificate to prove this. Alternatively the battery may be marked on top with a sticker explaining it is IATA approved. Never run your batteries completely flat, take care not to leave lights or any auxiliary equipment after use. Regular /daily users – always charge after use. Occasional users – charge your equipment before an outing and always after use (ideally when the ‘fuel gauge’ is at approximately 50%). When storing your scooter for more than 6 weeks, it is advisable to fully charge the batteries and disconnect them. Check and recharge the batteries monthly. Never switch off the charger before the charge complete indicator comes on. Always unplug the charger from the equipment, as well as the mains, after charging. (Some chargers can drain batteries if left plugged in while switched of or unplugged from the mains). Always dispose of old batteries through an approved source to prevent improper disposal. Please contact your supplier or local authority to find out an appropriate agent. I have turned on my mobility scooter, the lights are on, its fully charged but won't move, why? The most likely cause is that you have switched the power on before the scooter was put in to gear properly, so before you call out the recovery try this simple method. – Ensure the drive lever is properly engaged, put the lever back into neutral before re-engaging, sometimes a gentle rocking motion can help a ‘sticky lever’ engage. – Turn the scooter back on with the key… you will hopefully be back on your way now.